This pump is capable of handling up to 3/8" spherical solids. The Goulds 1DW dewatering pumps are some of the finest, most well-constructed dewatering pumps on the market today. 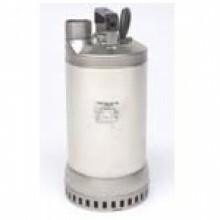 This pump series is specifically designed for handling dirty waters, draining ditches and pits, excavating in the building trades, industrial water drainage and general water transfer applications. For the series in general, the Goulds 1DW pumps can range up 100 GPM, reach maximum heads up 66 ft. TDH and can pass water with ⅜” spherical solids. 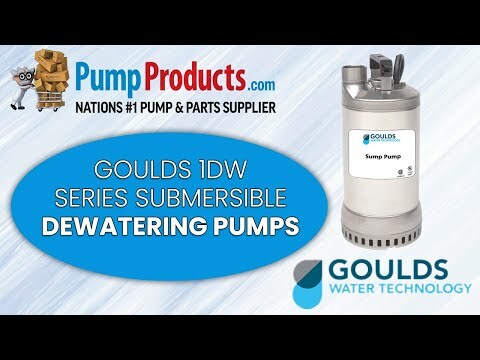 The Goulds 1DW submersible pumps can be submerged up to 23 ft. and can withstand temperatures up to 120°F. The construction is rugged and sturdy with the volute, open impeller, pump shaft and diffuser plate all made of AISI 204 stainless steel. The handle is the same but coated with polyacetalic resin. The mechanical seal has silicon carbide sealing faces. Both single and three phase models available. All pumps listed below come with a 30 ft. power cord. Single phase models have molded NEMA plugs and built-in capacitors while three phase models have bare leads.